The first stop is "Man's Past Futures" -- was that some kind of 1960s exhibition of then-paleo-future stories and materials? I want to ride the bubbleator! 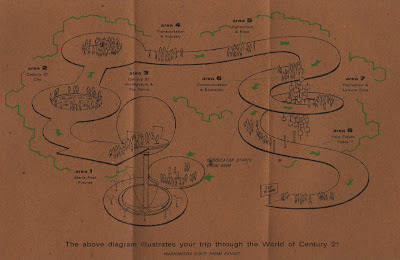 While I cannot stand the overpopulated and cheesy computer graphic imagery that is often used today in illustrating things, I also cannot get over how minimal, dark, and dare I say dull this so-called map of the fair is. Did they seriously think the appearance of this map would be some kind of enticement, or is this because I live in such a technocolor and information at my fingertips age? great stuff, mate. digging up the future ain't easy. this site is a big hit at my office.